Which? 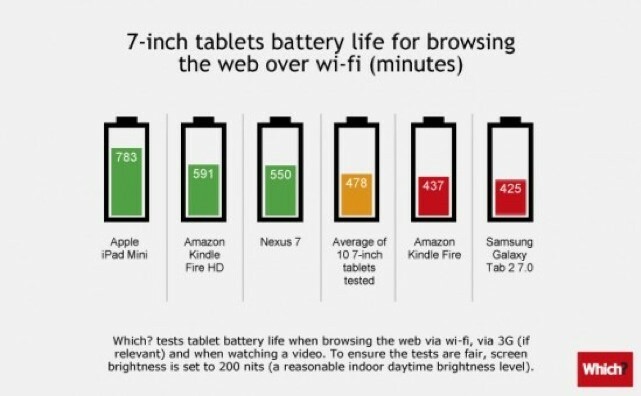 –the UK consumer site/organization/magazine — has put tablet battery life to the test. Tablets were split into two size groups, has their screens set to the exact same brightness (using an external calibration tool) and were used to browse the web until they died. And surprise! The iPad not only won in each category, but won by a landslide. The Retina iPad came tops in the full-sized tablet category, scoring 811 minutes (yeah, minutes are a pain but they’re also a much better way to see the differences between devices). In second place was the iPad 2 (590 minutes). 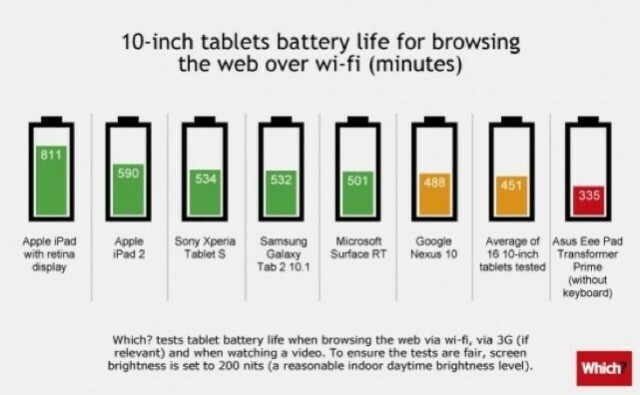 The best of the rest is the Sony Tablet S (534 minutes), followed by the Samsung Galaxy Tab 2. And as you can see from the chart, things get pretty laughable after that. As for “7”-inch tablets, the iPad Mini thrashes the competition, despite having a screen that is 35% bigger than its rivals. Next best is the Kindle Fire HD, with 591 minutes. Not listed (but available if you subscribe) are the charging tests, which tells you how long it takes to fully juice your device. My guess is that the Retina iPAd will win there, too – but not in a good way.